It seems I’ve actually only been out tramping five times this year, and three of those times have been in nearly the same place (near Holdsworth and Mitre Flats). I find this depressing in a way, but I guess it’s what happens when so much else has been going on and busying up my life. It has meant I’ve spent more time getting out on daywalks to visit some of the places closer to Wellington, and the most recent of these was to walk up the Rimutaka Rail Trail. not especially characteristic to this walk. The Rimutaka Rail Trail is one of those things I hear a lot about, but until now I’ve never made the time to go and check it out, mostly thanks to being busy with other things. The entire trail crosses from Upper Hutt to Featherston, crossing the gap between the Tararua and Rimutaka Ranges (or “the range” if you’re the sort of person who thinks of them as the same one). 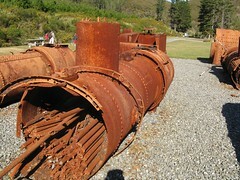 Historically, it’s the route that the railway line followed to connect Wellington with the Wairarapa, and special “Fell” locomotives, designed with low gear ratios and a centre grip track, were built specifically to slowly haul trains over the very steep (for a train) 1/15 gradient climb over the range. Building this long, snakey route over the range, including three tunnels, was a huge task for a lot of people in the latter part of the 19th century, but economically it was very important. The line was decommissoined and the specialised Fell Locomotives retired in 1955, at the opening of New Zealand’s longest railway tunnel of the day (8.8 km) which passes directly underneath. The Rimutaka Rail Trail was re-opened as a walking and mountain biking track a few years ago, and in that time it’s become very popular. Location: Pakuratahi Forest, near Upper Hutt. It’s common for people to visit the summit from either side, then walk back the way they came, although sometimes organised people will walk all the way across, and ambitious people might walk all the way over and all the way back in a long day. 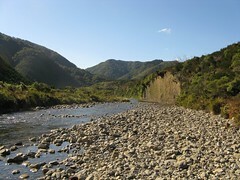 This time, I walked from the Upper Hutt side, and back again. It involves one short tunnel at about the 4.8 km mark (of a 10 km distance), but there’s a 500 metre tunnel just after the summit, which is very accessible, even if you’ve come from the other side. Ultimately it was just me, about ten or so other people out walking, and then about 150 or so people who woke up in the morning and decided what a fantastic idea it would be to get out and ride a bike up the Rimutaka Rail Trail. Apparently everyone in Wellington except for me owns a bike*, and people here like riding them. I can’t blame them really, since the Rimutaka Rail Trail is well optimised for easy-graded mountain biking. If you’re on a bike, you probably can’t get much easier than a long, almost flat road that winds and curves its way up an extremely eventual 100 metre climb. But I wasn’t on a bike, and I’m just thankful that people are polite enough to avoid running me over. 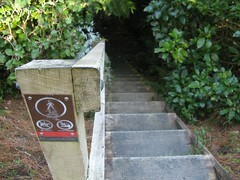 Up the trail from Upper Hutt. I left the carpark in bright sunshine at about 9.50am, and the conditions stayed similar to this for the entire time. Very quickly you go past a shooting range which (if anyone’s there) can be a surprise if it’s unexpected. This is not a typical walking track — it’s basically a road, and if there weren’t a couple of locked gates along the way it’d probably be possible to drive a truck over the route, assuming the bridges would hold up. I guess this shouldn’t be a surprise given the route’s history. A large part of the route runs alongside the Pakuratahi River, and I decided after a while that it’d been pointless to pack 2+ litres of water before I left because there were so many places to get water. I reached an area called Munitions’ Bend after about 45 minutes, where the road fords a stream. It’d be possible to jump in these conditions, but there’s a mammoth pedestrian bridge built beside the road anyway, so there’s no need to even risk getting wet feet. 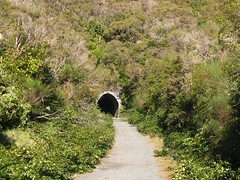 The 90 metre curved Pakuratahi Tunnel is about 10 minutes walk further along the road, I think at about the 4.8 km mark along the track, and it’s the only tunnel before the summit on this side. It’s not really necessary to have a torch, certainly when it’s so bright outside, but maybe it’d help if it was a little darker. The summit side of the tunnel is the site of the mid-point ventilation shaft over the current 8.8 km tunnel roughly 116 metres deep. Until you realise what it is, it just appears to be a small building of no clear significance. No motorbikes. (Eh???) Maybe motorbikes are allowed on this track in the first place, but I’m fairly sure they’re not. If they are, someone would really have to be pushing it to try and take their motorbike down these thin little steps to a stream-bed. All I can imagine is that this sign is either a mis-print, or that somebody’s actually tried it! 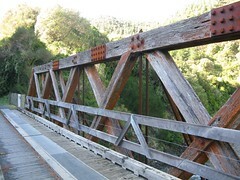 20 minutes further up the road is one of the old railway truss bridges (now restored) over the Pakuratahi River. Apparently, according to the helpful sign, they were a popular design in New Zealand up until about the 1930s. Anyway, the route from here is more long straight parts followed by occasional corners. It goes upwards very very slowly, and very frustratingly if you’re in the frame of mind that you’d like like to hurry up and get the climb over with rather than all this winding and very gradual climbing. I must admit that although I bet it’s great as an easy mountain biking track, and I found the historical side very interesting (especially having grown up in an extended family of railway enthusiasts), as a walking track I didn’t find it at all inspiring. 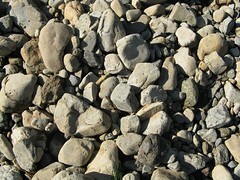 After a while, I found the hard ground underneath to be taxing on my knees, and had to take extra care because of it. I reached the “Summit” at around 11.40am, which is almost exactly 10 km along the route from the starting car-park on the Upper Hutt side, according to my borrowed GPS in any case. 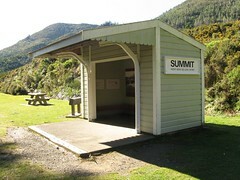 It’s important to note that “Summit” is not the summit of anything in particular except for being the highest point of the railway route. It’s also the name of the old and small railway township which supported the families who lived here to operate the railway switching yards at the top. The area is still home to some historic rusted remainders of old Fell locomotives, an old station house, some public toilets, and (it seems) a large number of nice people coming in and out on mountain bikes. 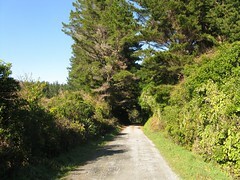 The rail trail continues past Summit and down to Featherston, but I wasn’t too keen on following it all the way down. It had only taken a couple of hours to get here and at that rate it would probably take 7-8 hours to walk the entire track return, but I wasn’t finding it the most interesting place to be out walking, and noticing that I’d forgot to pack any food alongside the 2+ litres of redundant water more or less sealed my decision to return from here the way I came. I did carry on a little further, though, to check out the Summit tunnel which is only a couple of minutes walk further on from the township. 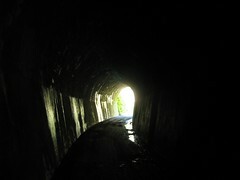 The entrance to the 576 metre Summit tunnel. The summit tunnel is awesome. It’s a mammoth 576 metres long. It felt a little strange walking into it on my own at first and after a while I started wishing I’d brought my heavy duty tramping head-torch instead of the dinky little one that I carry around in my daypack, which wasn’t terribly useful. It was fine though, and the tunnel’s completely straight so the main thing to be careful of is accidentally drifting too far to one side and walking into the wall. People ride bikes through this tunnel, often without lights, so while it’s not really necessary I guess I did feel slightly safer having a head-torch simply because it meant I was more able to be seen… and I did say hello to a couple of groups of 5 to 6 cyclists who came past me in the dark. I didn’t really leave the summit until about 12.20pm, around 40 minutes after I arrived. There was just something off-putting about the long, windy, hard road that would very gradually make its way back down to where I started from. I consoled myself by taking a couple of small 5 minute diversions down to the river on the way back, which was quite a nice place to be in the sunshine. When getting back to Munitions Bend I guess I walked through the small ford over the road, splashed around in my boots and got my socks wet on principle. It just felt better that way, heh heh. I got back to the start a couple of hours after leaving the summit. It’s actually a really nice walk and I find the historic part of the trail, and trying to visualise the building of and the use of it to be a really interesting experience, but I guess it wasn’t quite what I was hoping for on the day as far as a walk was concerned. In short, there wasn’t enough up and down. At some point I’d like to come up the trail on the other side, but probably more so I can say I’ve done it and to get the other side of the history rather than because I expect it to be too different. This is definitely optimised for easy cycling, although I say this without having seriously ridden a bike since my BMX days. * The only true bike worth having is a BMX, but I haven’t owned one since I was about 12. This entry was posted in update and tagged daywalk, independent trip, rimutakas. Bookmark the permalink.